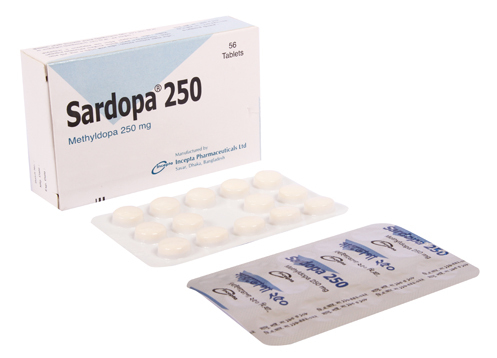 Sardopa 250 : Each tablet contains Methyldopa BP 281.960 mg equivalent to Anhydrous Methyldopa 250 mg.
Sardopa 500 : Each tablet contains Methyldopa BP 560 mg equivalent to Anhydrous Methyldopa 500 mg.
Methyldopa is an antihypertensive drug. Methyldopa, the L-isomer of alpha-methyldopa is levo-3-(3,4-dihydroxyphenyl)-2-methylalanine. Methyldopa is a white to yellowish white, odorless fine powder, and is soluble in water. 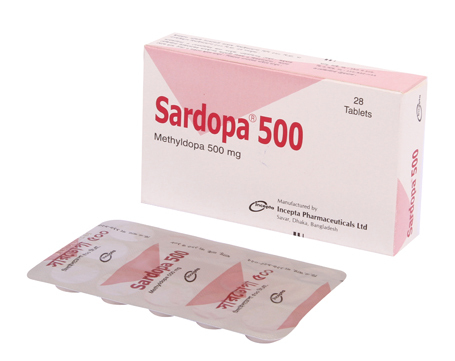 Methyldopa is supplied as tablets, for oral use. The usual starting dosage of Methyldopa is 250 mg two or three times a day in the first 48 hours. The daily dosage then may be increased or decreased, preferably at intervals of not less than two days, until an adequate response is achieved. To minimize the sedation, start dosage increases in the evening. When Methyldopa is given to patients on other antihypertensives, the dose of these agents may need to be adjusted to effect a smooth transition. When Methyldopa is given with antihypertensives other than thiazides, the initial dosage of Methyldopa should be limited to 500 mg daily in divided doses; when Methyldopa is added to a thiazide, the dosage of thiazide need not to be changed. The usual daily dosage of Methyldopa is 500 mg to 2 g in two to four doses. Although occasional patients have responded to higher doses, the maximum recommended daily dosage is 3 gm. Occasionally tolerance may occur, usually between the second and third month of therapy. Adding a diuretic or increasing the dosage of Methyldopa frequently will restore effective control of blood pressure. A thiazide may be added at any time during Methyldopa therapy and is recommended if therapy has not been started with a thiazide or if effective control of blood pressure cannot be maintained on 2 gm of Methyldopa daily. Methyldopa is largely excreted by the kidney and patients with impaired renal function may respond to smaller doses. Syncope in older patients may be related to an increased sensitivity and advanced arteriosclerotic vascular disease. This may be avoided by lower doses. Initial dosage is based on 10 mg/kg of body weight daily in two to four doses. The daily dosage then is increased or decreased until an adequate response is achieved. The maximum dosage is 65 mg/kg or 3 gm daily, whichever is less. Sedation, usually transient, may occur during the initial period of therapy or whenever the dose is increased. Headache, asthenia, or weakness may be noted as early and transient symptoms. The following systemic side effects may rarely occurs with the use of Methyldopa - angina pectoris, congestive heart failure, orthostatic hypotension, edema or weight gain, bradycardia, pancreatitis, colitis, vomiting, diarrhea, nausea, constipation, dryness of mouth, hyperprolactinemia, bone marrow depression, leukopenia, granulocytopenia, thrombocytopenia, hemolytic anemia; rheumatoid factor, hepatitis, jaundice, myocarditis, pericarditis, vasculitis, eosinophilia, parkinsonism, bell's palsy, nightmares and reversible mild psychoses or depression, dizziness, lightheadedness, paresthesias, arthralgia, myalgia, nasal stuffiness, rash, amenorrhea, gynecomastia, lactation, impotence. However, significant adverse effects due to Methyldopa have been infrequent and this agent usually is well tolerated. Some patients taking Methyldopa experience clinical edema or weight gain, which may be controlled by use of a diuretic. Methyldopa should not be continued if edema progresses or signs of heart failure appear. Pregnancy Category B.Methyldopa appears in breast milk. Therefore, caution should be exercised when Methyldopa is given to a nursing woman. There are no well-controlled clinical trials in pediatric patients. Information on dosing in pediatric patients is supported by evidence from published literature regarding the treatment of hypertension in pediatric patients.